if you’ve been around web development for a while, Dreamhost had a less than stellar reputation back in the early days, but I think they’ve improved a lot and they have a pretty straightforward interface for people like me who try to avoid server config files when possible. For instance, it early on had Google Apps integration (they handle updating the MX records for you), CloudFlare, and since this year, nearly automatic set-up of Lets Encrypt, which gives you SSL in a few clicks, and something that is almost a must-have these days. CakePHP 3 is currently tested up to 7.1 or even 7.2, so go ahead and pick the version you prefer. There is a PHP 5.6 available from the drop-down, but with 7 you get roughly twice the speed, so what not use it? Next, CakePHP 3 needs some extensions, specifically the mbstring, intl, and simplexml PHP extensions. on my Windows machine and FTPed up the files composer generated. For the database, DreamHost has a section under “goodies” to create and manage MySQL. You can copy the database credentials over to the app.php file in (the default ports in app.php all seemed to work for me, just remember to change the host from “localhost” to whatever you set it up to be) and you should see the familiar CakePHP welcome screen. At the time of writing, they only support MySQL 5.6 (not sure when 5.7 or higher support is coming), though some users have set-up other databases on DreamHost’s DreamCompute service. 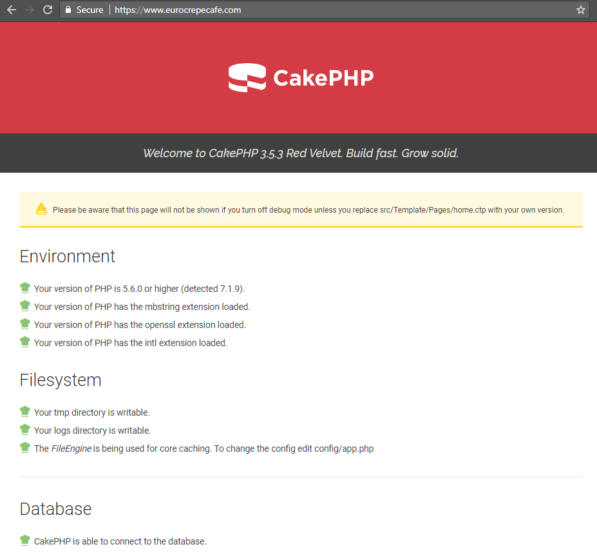 That’s it, you should now have server running CakePHP 3, that can be easily upgraded to CDN support (CloudFlare) and SSL.